Create a simple quest to kill some enemies using the Quest System. While you can simply use the Event System alone to create quests, the Quest System allows creating more complex quests and also supports automatic progression. This tutorial focuses on creating and adding the quest, you can learn more about the quest system in this how-to. For our hunting quest we’ll create a new Quest Type, the actual Quest and it’s Quest Tasks. Also, we’ll look into adding the quest to our game using the Event System. Keep in mind that this gameplay tutorial is based on the game tutorials, so we’ll be using data already created there (e.g. combatants, GUI boxes), you can easily adjust it to be used with your own project by simply selecting the things you’d like to use (e.g. other enemy combatants). Open the ORK Framework editor and navigate to Game > Quest Types. If you’ve already added your own quest types, you can either use one of them or add a new one – if this is your first time using the quest system, you can simply edit the Default Type. Change the following settings. Set to These quests require you to hunt enemies..
That’s it for the quest type. Navigate to Game > Quests. If this is your first quest, simply edit the exiting Default Quest, otherwise add a new quest. Change the following settings. Set to Killing Evil Pants. Set to Evil Pants has made some bad choices in live – it’s time to hunt him down.. The quest text is used to display more detailed information about a quest – it can be updated/replaced by individual quest tasks. Red Pants asked for your help to bring down Evil Pants. Go out into the field and hunt him down. A quest can give the player rewards (experience, items, weapons, armors and money) upon successfully completing it. We’re going to give the player some experience, items and money. Click on Add Experience Reward to add an experience reward. We’re giving a defined value reward. Click on Add Item Reward to add an item reward. Click on Add Item Reward again. And that’s it for the quest. The quest tasks handle the actual things the player need to do and the progress of a quest – navigate to Game > Quest Tasks. We’re going to need two tasks – one for killing the enemies and one for reporting back. For the first task, either edit the Default Task or add a new task. Change the following settings. Set to Kill Evil Pants. Set to You need to kill 3 Evil Pants.. These settings handle the conditions for activating the task. All tasks are inactive when a quest starts – only active quests can be finished. This task is the first task of our quest and we want it to be activated automatically. This means, the task will automatically be activated when the requirements are met. Since we don’t add any requirements, the task will be activated when the quest is added. These settings handle the conditions for finishing the task. The requirements can also be used to display the progress of a quest, in our case the number of already killed enemies. The task will automatically finish when the requirements are met. Now, we want the player to kill 3 Evil Pants to finish this task. Click on Add Enemy Kill to add a kill requirement. If enabled, the kill counter of the task will still increase even if the required amount of enemies has been killed. That’s it for our first task. Create a new task and change the following settings. Set to Report to Red Pants. Set to Report your success to Red Pants..
We want this task to update the quest’s text with new information. 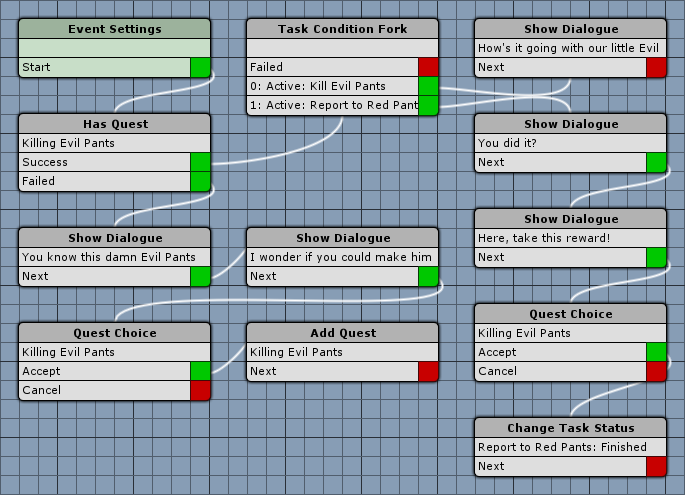 Set to:You’ve killed Evil Pants, report back to Red Pants.Be sure to add an empty line before the text – this text will be appended to the already existing quest text and we want it to start in a new line. This task should be automatically activated when the Kill Evil Pants task has been finished. Click on Add Quest Task to add a finished task requirement. This time we wont finish the task automatically – this will be handled by a game event used to report back to Red Pants. But we want the task to finish the quest when finished. And that’s it for the tasks. Quest layouts are used by menus and quest choices to display information of a quest (e.g. the tasks and rewards). The default quest layout is defined in Game > Game Settings in the Quest Settings. Let’s make it a little bit nicer – change the following settings. This will display the name of the quest (%n). The Content defines the actual text used to display the quest information – we can use a range of text codes to add the information we want, e.g. a list of active tasks or the rewards of the quest. How a task or reward is displayed is defined in following settings. The headers (tasks, rewards) will be displayed in bold, yellow text, the active tasks (%tac) and rewards (%ral) will display in a smaller text size. Now, the reward texts are fine as they are – they’ll display the name and quantity of the reward. We will change the task text – we want to add information about the finish requirement (%rfi). This will append the requirements directly to the task’s name – we’ll use this to simply add the number of killed and required enemies to the task’s name. This will display the current number (%) and the required number (%m) of the requirement’s goal (in our case, the number of killed Evil Pants). That’s it for the default quest layout. Notifications are simple dialogues that will automatically close after some time. We can set up notifications to let the player know of newly added quests or finished tasks. They’re also set up in Game > Game Settings in the Quest Settings. Change the following settings. This notification is displayed when a new quest is added to the player’s quest list. Set to Quest ‘%n’ added. This notification is displayed when a quest is finished. Set to Quest ‘%n’ finished. This notification is displayed when a task is activated (i.e. when a new task of a quest is available). Set to ‘%qn’: New task activated. This notification is displayed when a task is finished. Set to ‘%qn’: Task finished. And that’s it for the notification settings – for our current quest we don’t need more notifications (e.g. we currently can’t fail the quest). Click on Save Settings to save your changes. To add a quest into our game, we need to create a game event. The event will first let the player decide if he wants to do this quest and display different dialogues based on the current progress of the quest. Finally, the event will also finish the last task of the quest (reporting back). Navigate to Events and create a new Game Event. Click on Add Actor to add an actor (this will be Red Pants for our dialogues). This step will check if the quest is already added. If it’s already added, the event continues with checking the different status of the tasks, otherwise display some dialogues and let the player decide to start the quest. This step is connected to the Failed slot of the Has Quest step. You know this damn Evil Pants fella? We’re going to use the same settings, so copy the previous Show Dialogue step and change the following settings. This is a special choice dialogue that can display quest information using a quest layout. The choice itself doesn’t do anything with the selected quest, it only displays information. Depending on the player’s choice, you can add the quest or finish it and collect rewards after the quest choice. This step will add the quest to the player’s quest list. This step is connected to the Success slot of the Has Quest step. It’s used to check multiple quest tasks for their current status and continue the with the first valid state. Click on Add Task Condition to add our first task check. You can use this setting to negate a check, e.g. checking for the finished state with Is Valid disabled will be valid for inactive, active and failed. Click on Add Task Condition to add the 2nd check. Select Report to Red Pants. This step is connected to the Task Condition Fork‘s first condition slot (0, checking for Kill Evil Pants). We’re going to use the same settings as the previous dialogues, so copy one of the other Show Dialogue steps and change the following settings. How’s it going with our little Evil Pants problem? This step is connected to the Task Condition Fork‘s 2nd condition slot (1, checking for Report to Red Pants). Again, copy one of the other Show Dialogue steps and change the following settings. Finally … I’m not going to miss him. Again, copy one of the other Show Dialogue steps and change the following settings. This time, we’ll use the quest choice to only display the rewards of the quest and let the player decide if he wants to finish the quest (i.e. take the rewards) or not. We’re using a different quest layout this time – since we only want to display the rewards. %ralThis will display the rewards header in bold, yellow letters and add a list of all rewards. The rest of the layout settings can stay as they are. Finally, we’ll finish the report task – due to our settings, this will also finish the quest. And that’s it for our event – click on Save Event and save it as, e.g. killQuest. Close the ORK Framework editor. Open the town scene (1 Town, found in Assets/Tutorial Resources/Scenes/). 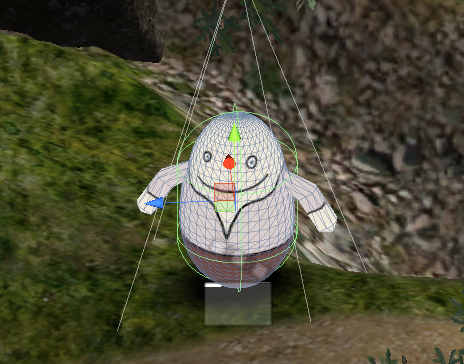 Coming from the game tutorials, we don’t have a Red Pants NPC in there yet, so drop it into your scene – you can find the prefab (NPC_red) in Assets/Tutorial Resources/NPCs/. Select killQuest (or however you named your event). Click on Ok after you selected the event. In it’s current state, the NPC can already be used, but we’re going to add a Quest Condition to only execute the event when our quest isn’t already finished. This is useful if you’re using a NPC to give multiple quests or events. Click on Add Quest Condition and change the following settings. And that’s it, save the scene. To test our quest, open the main menu scene (0 Main Menu) and hit play – when talking to Red Pants, you can start the quest, go out and kill enough Evil Pants and return to report.